Fritz Lugt (+) (1884-1970), The Hague. with Jacques Goudstikker, Amsterdam, 1929. C. Wright, Paintings in Dutch Museums. An Index of Oil Paintings in Public Collections in The Netherlands by Artists born before 1870, London, 1980, p. 381. Old Master Paintings: An illustrated summary catalogue, Rijksdienst Beeldende Kunst (The Netherlandish Office for the Fine Arts), The Hague, 1992, p. 247, no. 2149, illustrated. Amsterdam, Catalogue des Nouvelles Acquisitions de la Collection Goudstikker, November-December 1929, no. 31, illustrated. Paris, Fondation Custodia, on loan. The Hague, Museum Bredius, on loan. 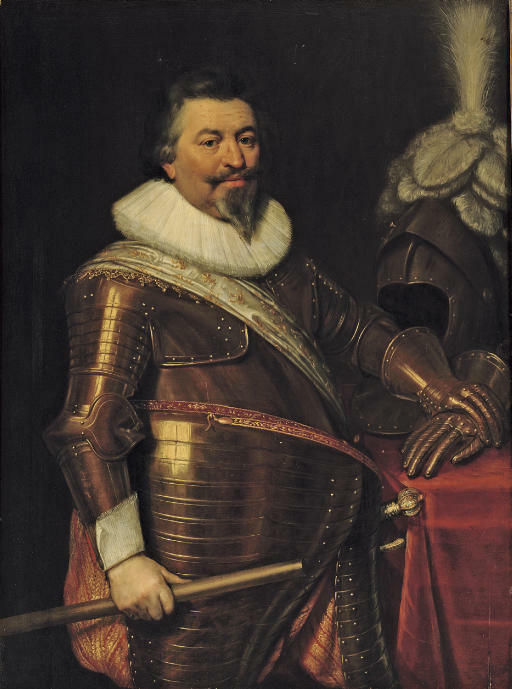 The majority of Ravesteyn's portraits date form between 1610 and 1640 and he painted many high ranking military officers, members of the highest social circles, and men involved in government who were stationed in the city from all over the Dutch Republic. Among his most important works are a series of officers' portraits (Mauritshuis, The Hague), most likely commissioned by Prince Maurits in 1611, and a portrait of Prince Frederick Hendrik (Dutch Royal Collection) of 1612. Not all of his portraits, however, were conventional. His 1618 Epitaph of Adriaen van Maeusyenbroeck and Anna Elant (Museum Het Catharijneconvent, Utrecht) updated the traditional Catholic memorial painting by bringing the elements of the triptych format into the confines of a single panel. Ravesteyn is often associated with the Delft portraitist Michiel van Mierevelt. He was recorded in Delft in 1597, which has led to speculation that he studied with Mierevelt but the latter's influence can only be seen in works painted after 1610. Ravesteyn is recorded as entering the Hague Guild of St. Luke's in February 1598 and the following year painted a portrait of the Remonstrant leader Hugo de Groot at the age of 16 (Paris, Fondation Custodia, Institut Néerlandais). He painted hundreds of portraits over the course of his career and ran a large and successful studio. His production slowed remarkably after 1641 but he was still an important member of the Hague artistic community as evidenced by his invitation to join Pictura in 1656.